Feeling stressed out? One thing we know about stress is that it makes things a lot harder - more and more as you reach your personal crisis point. The game show ‘The Cube’ relies on this fact - asking people to perform tasks or challenges that otherwise might be relatively easy, but making them much more challenging by deliberately engineering the situation to put them under as much stress as possible. Check out this example to see how it works - notice how Phillip Schofield (the presenter) ranks up the stress with the things he says as the contestant is getting ready! You can also check out some articles by Robert Sapolsky - inc this one on the physiology of stress or listen to the man himself talking about why humans experience so much more stress than other animals. 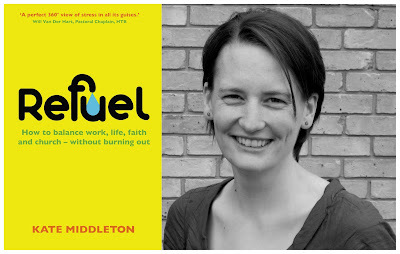 Refuel: How to balance work, life, faith and church - without burning out by Kate Middleton is available in paperback, priced £9.99. 1 - I’m stressed, get me out of here! 3 - Are you a stresshead? 4 - Is your passion stressing you out? 5 - Can you care too much? 6 - Are you burned out?